Vegas Crest Casino Review (2019) - 200% bonus up to 1000 €/$ in BTC! Vegas Crest Casino is an online casino founded in 2014. The casino has recently added Bitcoin deposits. The cryptocurrency deposits convert to Euros or US Dollars. After that, you can also withdraw your balance in Bitcoins. 752 casino games Join now! Vegas Crest has about 800 casino games from 10 casino game providers. There are also more rare providers like Mobilots, Rival and Saucify and also exclusive Vista Gaming’s games not playable anywhere else. This is how the Vegas Crest casino homepage looks like. 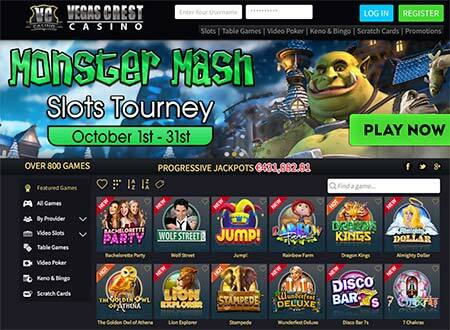 In October 2018 there is a Monster Mash slots promotion going on. Vegas Crest Casino is an online casino founded in 2014. The casino has recently added Bitcoin deposits. Your deposit converts to Euros or US Dollars. After that, you can also withdraw your balance in Bitcoins. You can also play directly with FIAT currencies (US Dollars, Euros or British Pound). The deposits can be made through VISA, Mastercard, UPayCard, Skrill, Neteller, Paysafecard, ecoPayz or Wire transfer. The company behind Vegas Crest is a very experienced company called Vistagaming. They have been in the industry for ages starting year 1996! 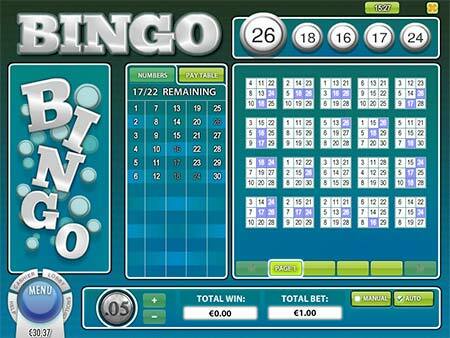 Vistagaming hosts also many other online casinos and online bingo rooms. Vegas Crest Casino has a casino licence in Curacao. The casino bonuses are quite good with 10 no deposit free spins, 200% first deposit bonus up to 1000 EUR/USD (in Bitcoins) and 300% second deposit bonus up to 1500 EUR/USD. Long casino history from 2014 and the background company Vistagaming was founded back in 1996! Blast! Boom! Bang! 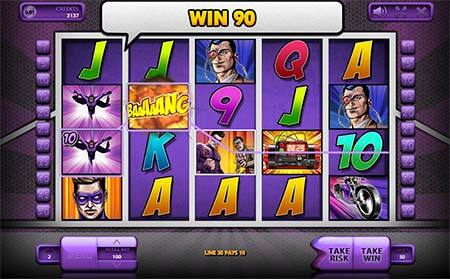 is a 5-reel slot game from Endorphina. An example of a more modern game with very nice audiovisual content. We couldn’t find an official Vegas Crest Casino thread from cryptocurrency forums like BitcoinTalk.org. In the Vegas Crest loyalty program you can earn Comp Points. 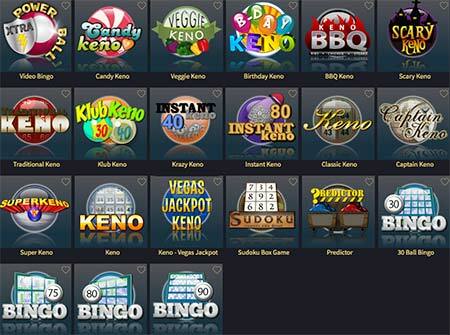 For every 1 EUR or USD you wager on Slots, Keno, Bingo or Scratch Cards, you will earn 2 Comp Points. All other games earn you 1 Comp Point for every 1 EUR/USD wagered. Every 1,000 Comp Points is equivalent to 1 EUR/USD and you can redeem them at any time for real cash. So there is no complicated rules or small print. Just play, earn, and redeem at any time. Some of the progressive (jackpot) slot game selection at Vegas Crest Casino. The casino bonuses in Vegas Crest are quite satisfactory. All deposit bonuses are subject to a minimum wagering requirement of 30 times (30x) the value of the deposit plus the bonus. Example: If your deposit is 10 EUR and the bonus awarded is 10 EUR, the play-through (or wagering) requirement will be 30 times 20 EUR = 600 EUR before any withdrawals may be made. So you must wager the bonus money 60x before you can withdraw winnings. Casino games contribute differently to wagering, please see the list below. We tested the Bitcoin deposits with 10 Euros. First you must enter the amount in Euros or US Dollars. 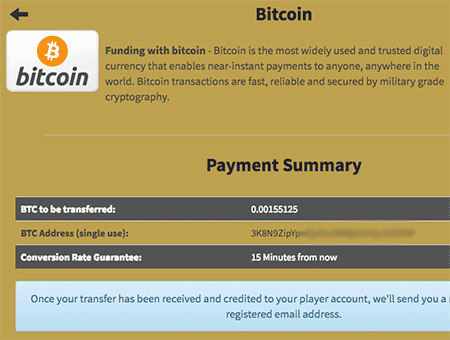 In the next screen, you will be given the amount in Bitcoins and a one-time deposit address. First you can decide the deposit amount in Euros or US Dollars. Then you are given the BTC amount and a deposit address. Unfortunately no QR-code. There is no QR-code to the deposit which would be nice, but copy-pasting the deposit address works ok. The deposit went through in some 10 minutes, no problems with that. The Bitcoin withdrawal course was quite good. We wanted to deposit 10 Euros, but the withdrawal cost only 8,67 Euros in our Bitcoin wallet. But we got the full 10 Euros to the Vegas Crest account. Well suits us! We noticed also that the deposit limit for our new test account was 200 Euros, even though the first deposit bonus should be up to 1000 Euros. We asked this from the customer support and you can probably raise that higher at least to the next deposits. No Vegas Crest bonus codes are needed to get the deposit bonus. Just click any link in this Vegas Crest review to get the bonuses. You will get 10 free spins with no deposit. Just register your account and you are good to go! 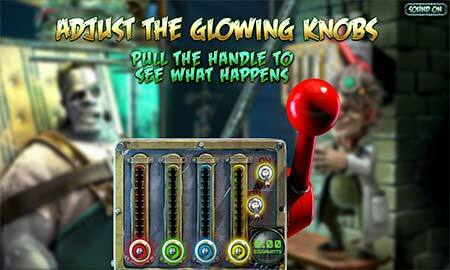 The free spins are credited to a slot game Frankenslots Monster from Betsoft game provider. Table games contribute from 10% to 25% to wagering. Full list can be seen in Vegas Crest homepage -> Bonus terms. 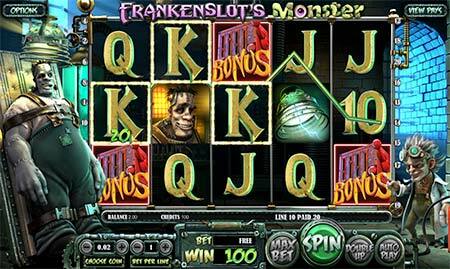 Frankenslots Monster slot game from Betsoft. You can get 10 no deposit free spins to this game by just registering a new account. If you are lucky, you can get a bonus round from the 10 free spins! 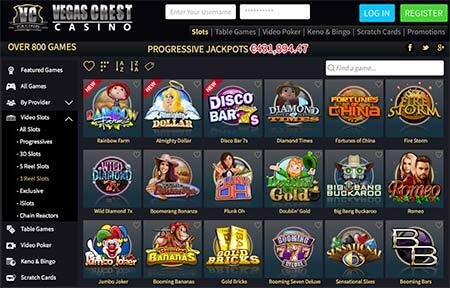 Vegas Crest Casino brings you 752 casino games from 10 different game providers. The casino game providers are as followed: Betsoft, Booming Games, Concept Gaming, Endorphina, GameArt, Habanero, Mobilots, Rival, Saucify and Vista Gaming. There are some less often seen providers like Mobilots, Rival and Saucify. 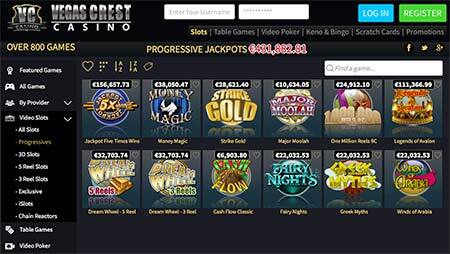 Also the exclusive Vista Gaming games can only be played in Vistagaming casinos like Vegas Crest. In general most of the games are high quality visually and auditorily. Few games however were quite oldish with small not-scalable screens and horrible sounds. Also some games need Adobe Flash which isn’t this day. Flash games work quite slow and there has been some security issues with Flash. The casino game search box works great, the results update in real time as you type. Also the casino lobby works quite fast, while not being the fastest on the field. So no problems finding the right game. 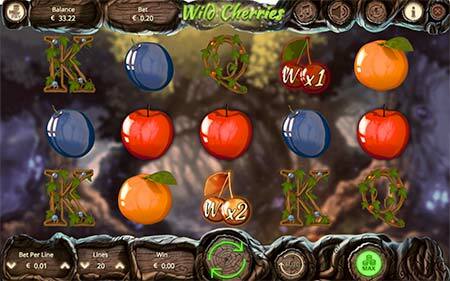 This is Wild Cherries 5-reel slot game from Booming Games. Vegas Crest Casino doesn’t provide any live casino games with a live dealer. Vegas Crest Casino provides a lot of old school type 3-reel slots. In many casinos you cannot search them separately, but at Vegas Crest you can. 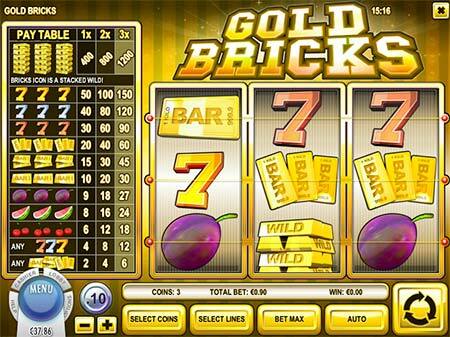 Gold Bricks is one example of a classic 3-reel slot game. The game is Vistagaming’s own exclusive game playable only at Vegas Crest. 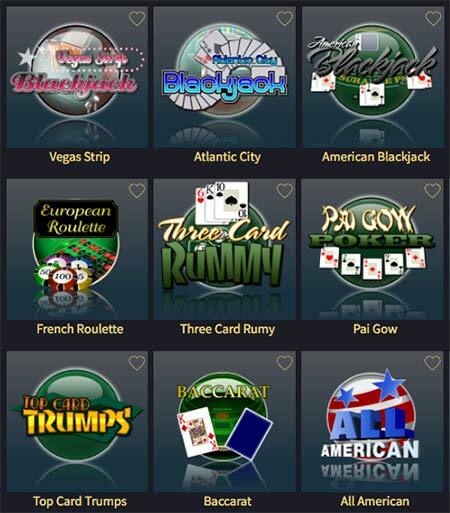 Here are some examples of the table games selection at Vegas Crest. 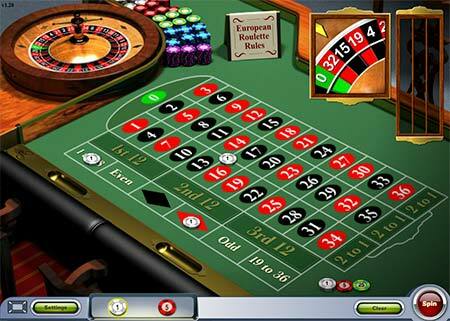 Of course you can choose table games like European (French) Roulette here from Vistagaming. A speciality at Vegas Crest is a huge amount of Bingo, Keno and Scratch games. This is Scary Keno from Vistagaming. 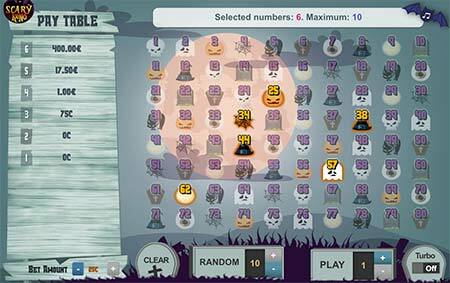 And here is one of the many Bingo games from Vistagaming. Bitcoin deposits are almost instant depending on the cryptocurrency network traffic. The Bitcoins are then converted to either Euros or US Dollars depending on your country. You can also withdraw your FIAT currency winnings to Bitcoins. All the deposits are almost instant except wire transfer. See the full list of restricted countries from Vegas Crest homepage -> Terms & Conditions. Bonus Codes: No Vegas Crest bonus codes are needed to get the bonuses. Fax…LOL 🙂 Number (00356) 2133 1804. You must dial 00 if faxing from Europe. The company behind Vegas Crest is a very experienced company called Vistagaming. They have been in the industry for ages starting year 1996! Vegas Crest has a casino licence in Curacao. Please write your own Vegas Crest Casino review and comments below! Or if you want to see more Bitcoin casino reviews, go here to check them out.